How Do Breast Implants Impact Cancer Diagnosis and Treatment? Breast cancer, unfortunately, is incredibly prevalent today. While some are genetically predisposed to breast cancer, others are not, and yet, they are still diagnosed. There are standard protocols for self examination, yearly exams with physicians, and mammograms or ultrasounds but those protocols change slightly if you have breast implants. While neither saline nor silicone breast implants increase the risk of breast cancer, having breast implants can impact diagnosis and treatment. Many wonder or worry that if they have augmented breasts that detection or prognosis will be impacted adversely. While all studies note that more research is needed and important to further clarify findings, studies including one from Cancer Epidemiology, Biomarkers and Prevention show that women with breast implants have a higher occurrence of advanced stage breast cancer, “This study provided further evidence that women with breast implants have a higher likelihood of being diagnosed with advanced breast cancers compared with nonaugmented women. No differences were observed for stage at diagnosis according to implant characteristics. The more advanced stage at diagnosis among augmented women led to an association of breast implants with poorer breast cancer-specific survival although this result did not reach statistical significance.” For all women, including women with augmented breasts, it is important to conduct regular self-examinations and have regular checks with your doctor. Additionally, depending on certain characteristics such as age or family history, it is important to get a routine mammogram. Mammogram screening is different for women with breast implants than for those without. The American Cancer Society describes mammogram imaging for those with breast implants, “Women who have implants are a special challenge for mammogram screening. The x-rays used for imaging the breasts cannot go through silicone or saline implants well enough to show the breast tissue that is over or under it. This means that the part of the breast tissue covered up by the implant will not be seen on the mammogram. In order to see as much breast tissue as possible, women with implants have 4 extra pictures (2 on each breast) as well as the 4 standard pictures taken during a screening mammogram. In these extra x-ray pictures, called implant displacement (ID) views, the implant is pushed back against the chest wall and the breast is pulled forward over it. 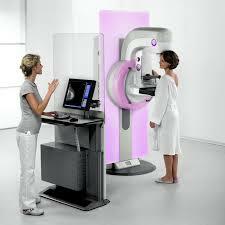 This allows better imaging of the front part of each breast. Implant displacement views are more difficult (and can be less comfortable) in women who have had hard scar tissue form around the implants (contractures). They are easier in women whose implants are placed underneath (behind) the chest muscle. Although these women do have more pictures taken at each mammogram, the guidelines for how often women with implants should have screening mammograms are the same as for women without them.” Having breast implants does not increase your risk of getting cancer and it is important to remember that the key to early detection is routine screenings through physician exams and mammograms.